The Indian Shield was formed by a terminal collision between the northern and the southern Indian continental blocks (NIB and SIB) at the end of Mesoproterozoic and Early Neoproterozoic after initial plate interactions in Early Mesoproterozoic. 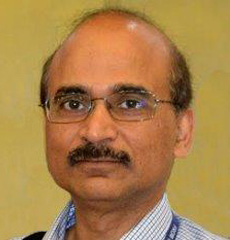 The Late Mesoproterozoic-Early Neoproterozoic was also the time when Rodinia was assembled, but it is unclear whether India was a part of Rodinia. After Rodinia disintegrated in Mid-Neoproterozoic, the resulting blocks reassembled in Early Paleozoic to form Gondwana. In classical reconstructions, the position of India with respect to Australia-Antarctica is approximately the same in Rodinia and Gondwana. 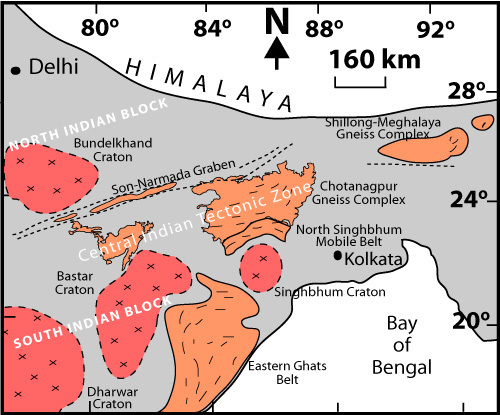 The granulite gneiss complexes of the Central Indian Tectonic Zone (CITZ) comprised of the Sausar Belt in central India and the Chotanagpur Gneissic Complex (CGC) in eastern India, the Shillong-Meghalaya Gneissic Complex (SMGC) in northeastern India, and the Eastern Ghats Belt (EGB) along the Indian east coast preserve key evidence of the above mentioned tectonic events. 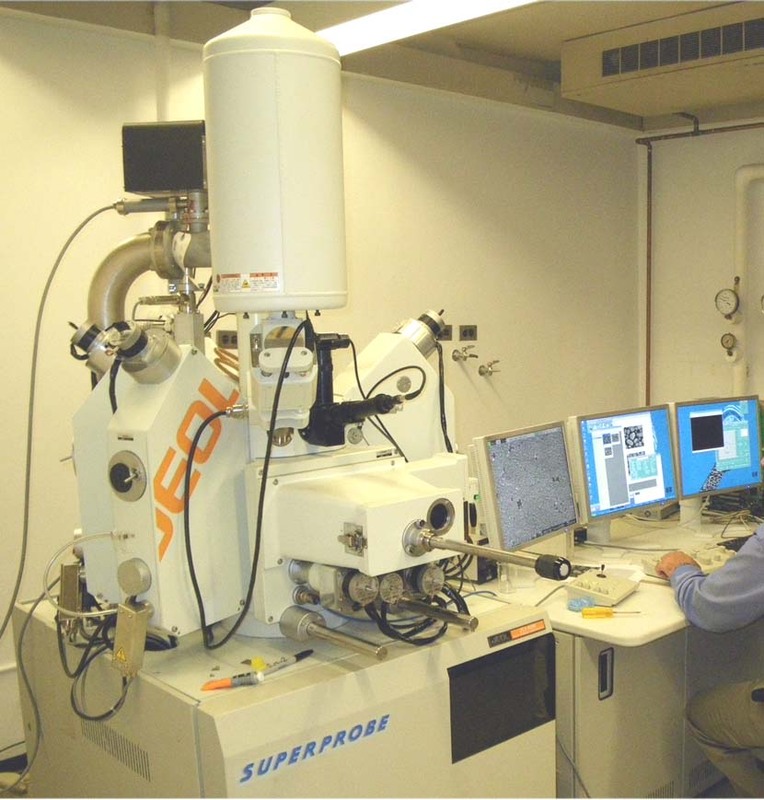 In this study, we attempt to correlate the metamorphic histories of these gneissic complexes with the tectonic events through P-T pseudosection analysis, U-Pb zircon dating with isotope dilution-thermal emission mass spectrometry (ID-TIMS), and U-Th-Pb monazite chemical dating with the electron microprobe (EPMA). Peraluminous granite intrusion is recorded at 1697 ± 17 Ma outside the northern boundary of CGC. Granulite-facies metamorphism related to a collision of the SIB with an island arc occurred at ~1.6 Ga along the southern boundary of Sausar Belt and in northwestern SMGC. Calculated P-T pseudosections in the KFMASH and MnCKFMASH-PYCe systems indicate that the 1609 ± 9 Ma anatectic metapelite granulites of northwestern SMGC were metamorphosed at peak P-T conditions of ~8 kb/850oC and along a counterclockwise P-T path with <3 kb/600oC progade and ~5.5 kb/630oC retrograde conditions. This path is consistent with prograde and post-peak monazite growth, formation of cordierite + K-feldspar + garnet/orthopyroxene bearing assemblages during peak metamorphism, and retrograde growth of xenotime and staurolite. The lithological association, and age and P-T path of Late Paleoproterozoic metamorphism in northwestern SMGC, at the eastern margin of CGC (see below), and in southern Sausar Belt are similar. The ~1.6 Ga collision zone extends over 650 km in an ENE-WSW direction between Sausar Belt and NE CGC. However, although a similar collision occurred in NW SMGC, it is not clear whether the CGC was attached to the SMGC at c. 1.6 Ga (see below). The collision was followed by emplacement of the Bengal Anorthosite in southeastern CGC at 1550 ± 2 Ma. Subsequent high-grade Grenvillian metamorphism (peak P-T: 7-10.5 kb/788-861oC at northern CGC) recorded by xenotime growth at 975 ± 67 Ma in northwestern CGC granite gneiss, zircon growth at 947 ± 27 Ma in Bengal Anorthosite, and monazite growth at 995-950 Ma in northeastern CGC metapelite granulite indicate an Early Neoproterozoic terminal collision between the SIB and the NIB. A NE CGC metapelite shows a clockwise P-T path with prograde metamorphism from <7 kb/700oC to ~14 kb/825oC followed by decompression. 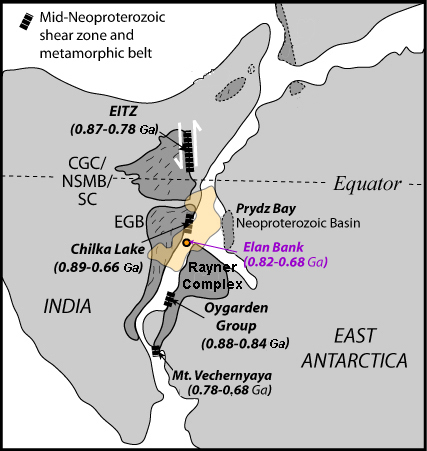 The SIB-NIB collision is coeval with the collision between EGB and Rayner Complex of East Antarctica, and emplacement of the Chilka Lake Anorthosite in northeastern EGB at 983.0 ± 2.5 Ma. All these Early Neoproterozoic (983-947 Ma) events may be temporally correlated with the assembly of Rodinia. The eastern margins of CGC, North Singhbhum Mobile Belt (NSMB) and Singhbhum Craton (SC) are overprinted by Mid-Neoproterozoic high-grade metamorphism, ductile deformation and sinistral shearing along the north-south oriented Eastern Indian Tectonic Zone (EITZ). Monazite chemical dates and garnet zoning profiles in anatectic quartzofeldspathic gneiss indicate that metamorphism in northern EITZ occurred at 876-784 Ma along a counterclockwise P-T path with a prograde stage from 8.93 kb/794oC to 8.80 kb/809oC, loading to 10.22 kb/777oC and isothermal decompression to 6.83 kb/787oC. Thus, the P-T path in northern EITZ is distinctly different from the P-T path in NE CGC. Furthermore, diffusion modeling in garnet indicates that the rates of burial (3.5-8.4 km/Ma) and exhumation (2.2-7.2 km/Ma) were similar during the c. 1.0 Ga metamorphism in NE CGC, but exhumation (15-27 km/Ma) was ~8-25 times faster than burial (1.1-2.0 km/Ma) in northern EITZ during the 876-784 Ma (Tonian-Cryogenian) shearing. Thus, the burial and exhumation rates in NE CGC and EITZ are also remarkably different. Similar Tonian-Cryogenian dates from Chilka Lake of EGB, Elan Bank of Kerguelen Plateau (where 824-675 Ma conglomerate-hosted metapelitic clasts show a retrograde P-T path from 8.3kb/766oC to 6.7kb/737oC), and Oygarden Group and Mt. Vechernyaya of Rayner Complex indicate that the EITZ was an ~1800 km long Neoproterozoic orogenic belt stretching from eastern India through Kerguelen Plateau to East Antarctica. Sinistral shearing in the EITZ at 876-784 Ma indicates a distinct period of southward movement of the Indian block with respect to Australia-Antarctica. Hence, rifting between India and Australia-Antarctica and northwestward movement of India during Rodinia break-up, as proposed in classical models, did not occur before ~780 Ma. Additionally, cores of garnet porphyroblasts in northern EITZ metapelite contain inclusions of Late Paleoproterozoic (c. 1.8-1.6 Ga) monazite. P-T pseudosection analysis in the MnCNKFMASH-PYCeF system shows that the monazite inclusions likely formed at ~5-7 kb/ >550oC. These P-T results, combined with prograde and retrograde P-T paths from other studies, indicate a counterclockwise Late Paleoproterozoic P-T path that is remarkably similar to the P-T path of c. 1.6 Ga metapelites from NW SMGC. Counterclockwise Late Paleoproterozoic P-T paths from the southern Sausar Belt of Central India, the NE CGC, and the NW SMGC may be related to the assembly of the Columbia supercontinent. However, the SMGC became aligned with NE CGC only after Tonian-Cryogenian shearing in the EITZ. Thus, the central Indian collision zone may not have extended up to the SMGC. The N-S foliation in NE CGC is the manifestation of a c. 1.0 Ga collision between the CGC and a block to its east, the Dinajpur Block. The Indian Shield was probably formed by a northward collision of the SIB with the NIB, a westward collision of the NIB with the Marwar Block, and a westward collision of the Dinajpur Block with the NIB along the EITZ, all happening simultaneously at c. 1.0 Ga. The EITZ was reactivated in Tonian-Cryogenian when sinistral shearing between the NIB and the Dinajpur Block moved the SMGC into alignment with the northern margin of the CGC. This was followed by dextral stike-slip movement on the Dauki Fault along the southern margin of SMGC in Cretaceous that split the Dinajpur Block and brought the SMGC to its present position with respect to the CGC. Finally, the northern parts of the NIB and the Dinajpur Block collided with the Asian Block in Cenozoic and formed the Himalayan orogen. Early Paleozoic high-grade metamorphism and thrusting at the contact of EGB with the Archean cratons of India, as well as at the southeastern margin of Rayner Complex, occurred during the Pan-African assembly of Gondwana. During this time (Late Cambrian, 494 ± 6 Ma), the central part of SMGC was intensely reworked by granulite-facies metamorphism along a clockwise P-T path with near isobaric prograde heating between 635oC and 730oC at ~5.7-5.5 kb, peak metamorphism at ~5.5 kb/730oC, and cooling between 650oC and 595oC at 3.4-3.2 kb. 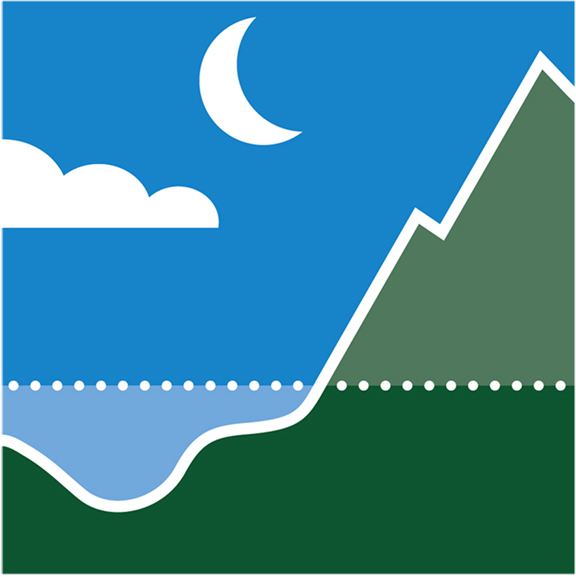 The retrograde segment of this P-T path is similar to that from Prydz Bay in East Antarctica. 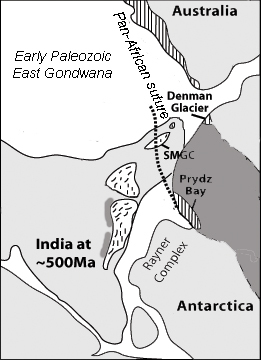 Thus, the Prydz Bay Pan-African suture passes through SMGC, and the Early Paleozoic (494 ± 6 Ma) metamorphism in SMGC may be correlated with a collision between India and Australia-Antarctica during the assembly of East Gondwana.